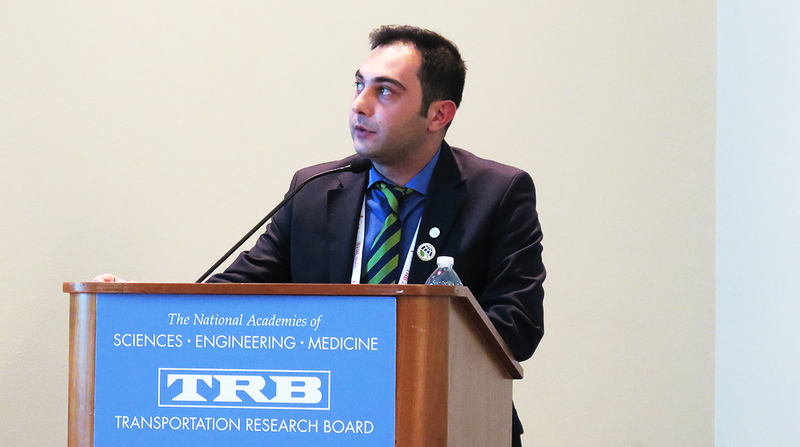 Eren Yuksel, a researcher from the University of South Florida who specializes in traffic and highway engineering, presented a report on freight movement in Portland, Ore. Specifically, Yuksel studied the northbound and southbound lanes of a 2.5-mile stretch of Interstate 5 that runs through the city. Yuksel said focusing on a specific segment and analyzing freight-related data, such as speed and truck bin length, can present a fuller picture of a route’s traffic movement and road incidents. I-5 runs north from San Diego all the way through Washington. Yuksel said he focused on I-5 because of the route’s important role in the Canada-Mexico corridor. Data can offer a glimpse of the buildings that surround routes in addition to the traffic patterns that move along them. Makarand Gawade, a transportation planner with HDR Consulting, identified freight activity areas throughout Florida. Freight activity areas refer to clusters of facilities that generate goods or attract significant freight movement. The goal of his project was to determine the location of these areas and their effects on Florida’s road system. Gawade said he was able to present the Florida Department of Transportation with the spatial location of various hubs, such as spaceports, intermodal centers and terminals. He said future research will involve identifying the road segments that connect these freight activity areas to major corridors. Moby Khan, an associate at Cambridge Systematics Inc., corroborated the idea that private sector research can benefit public agencies. Khan and his team conducted a project to gain a better understanding of the trucks that are registered in and travel through California. Based in Medford, Mass., Cambridge Systematics is a transportation consulting firm. Using phone calls, mail and online research, Khan and his team surveyed large and small fleets. Khan said they set out to collect 13,000 responses and received about 15,000. According to Khan, the data collection was done for the California Department of Transportation in order to compile data on the physical and operational characteristics of the state’s commercial vehicle population. Caltrans manages a truck survey that is modeled after the National Vehicle Inventory and Use Survey, which was discontinued in 2002. It is meant to inform infrastructure planning efforts across the state. Khan said Cambridge Systematics is currently helping Caltrans develop a freight forecasting model using data obtained from the survey. He said his team’s data can benefit agencies beyond Caltrans. For example, he said the California Air Resources Board could use the data set for air quality research.